Can't attend? Follow Explode your Digital Marketing Knowledge to know of future events! Are you looking for ways to skyrocket your Facebook Marketing efforts? Do you currently own a Facebook page, and hope to market your product and services better on Facebook, creating more awareness, and generate quality leads? Do you want to upgrade yourself with practical knowledge without paying thousands of dollars for a course? Do you need a quick crash course so you can be better equip about Facebook Marketing for your startup or work? At Sky Digital Agency, aside conducting Full Day Skills Future Approved workshops, we also provide short workshops for the busy millennials who need that extra boost on digital marketing. 4. 3 Strategies to build your fans! By the end of the workshop, you will be able to market better on Facebook for your work, startup or business. Please bring along your laptop & charger for the lesson. Please come on-time as we start promptly! 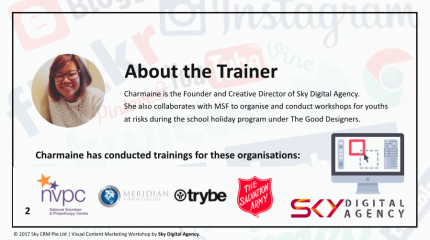 Charmaine, is the Lead Trainer, Founder and Creative Director of Sky Digital Agency. 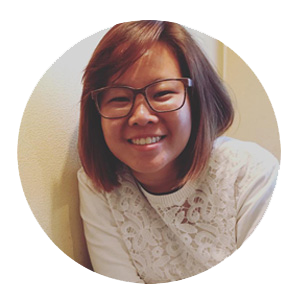 She is generous in dishing out tips and tricks, and always excited to help participants build on their Digital Marketing Strategies. Charmaine makes learning interactive, candid and fun, helping learners to be excited about applying what they have learned in their work or business even after the workshop. Always looking for opportunities to pay it forward to the community with her knowledge and skill-sets, Charmaine also trains youth at risks (in collaboration with MSF) under her social enterprise called The Good Designers. Alternatively, if you prefer to join us for our full day Skills Future Approved & Claimable workshops, here's a video on what you will be learning in our "Facebook Marketing & Lead Generation" workshop. 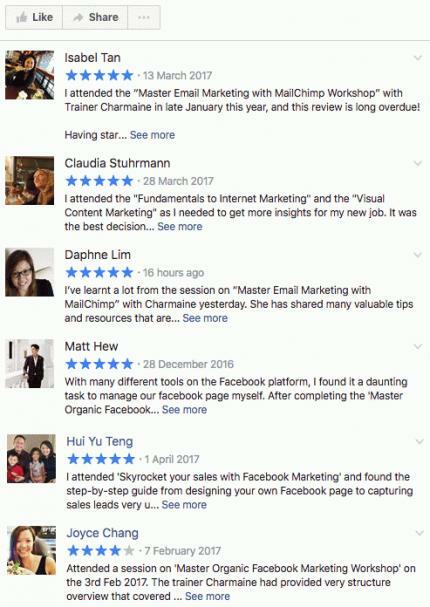 The next run of the Full Day Facebook Marketing Workshop is on 19 April 2017, 29 April (Sat), 3 May and 20 May (Sat) 2017.